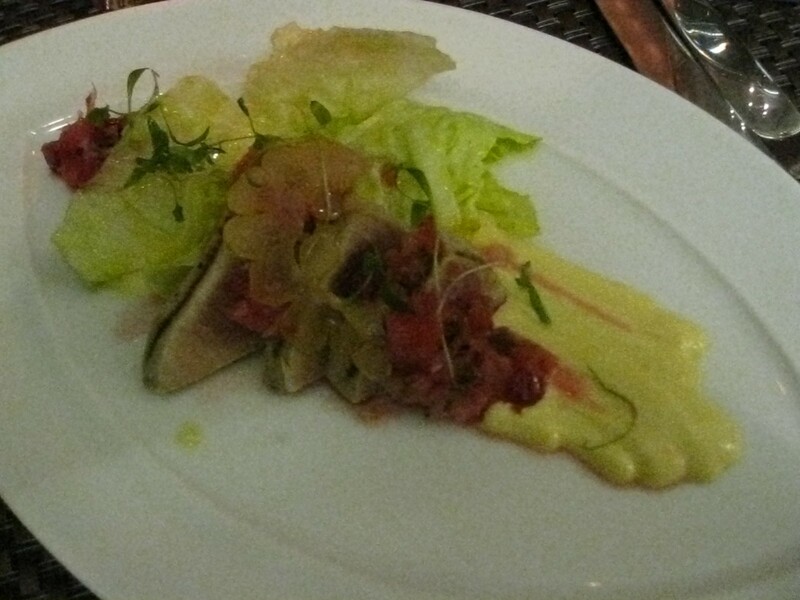 My elementary school friend and I decided to go to Cafe Boulud for dinner this past Wednesday. At first we were going to go to Nota Bene but my friend’s colleagues were raving about Cafe Boulud so we decided to change the restaurant. Cafe Boulud is located on the second floor of the Four Seasons Hotel at Bay and Yorkville. It’s very fancy so dress appropriately. We had reservations at 7:45pm however the restaurant was running late so we had to wait for a table. 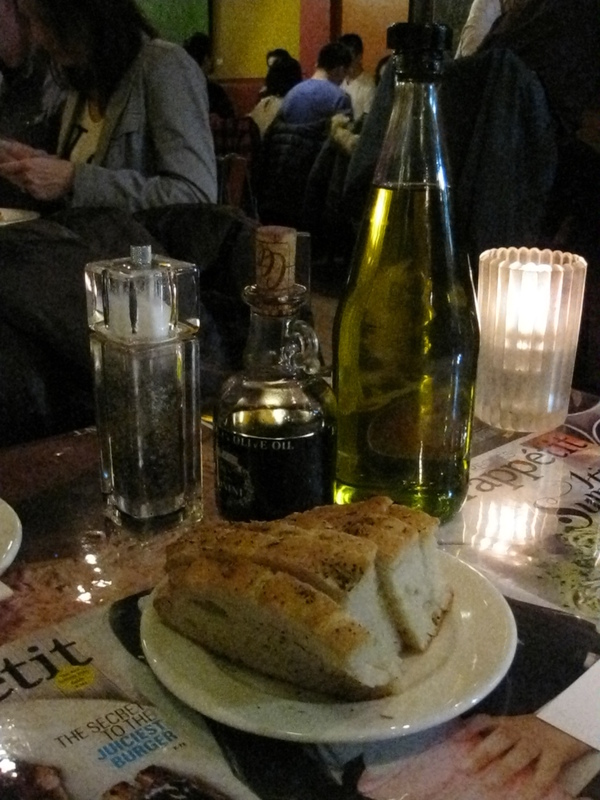 We were given a bread basket with butter when we sat down. My friend liked the bread whereas I wasn’t a fan of it. 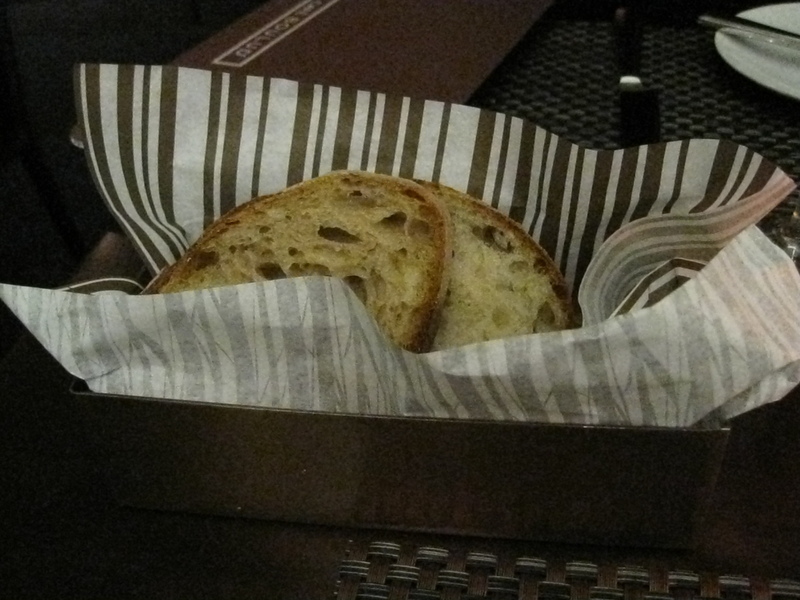 I much prefer the bread at bb33 bistro and brasserie. My friend and I both ordered the Seared Albacore Tuna for the appetizer and the Caramelized Pear Sundae for dessert. My friend had the Grilled Mackerel while I got the Roasted Lamb Shoulder. 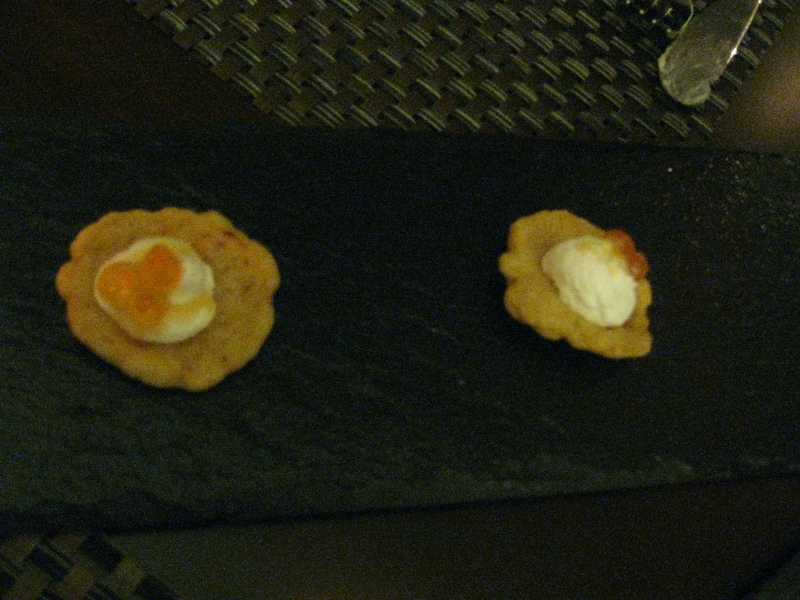 While we were waiting for our food, we were given caviar on top of yogurt and shrimp cracker which were compliments of the chef. My friend didn’t like it while I thought it was alright. The seared albacore tuna includes iceberg lettuce, citrus confit, blood orange, and buddha’s hand. It was delicious. My friend liked how the appetizer has sweet accents to it. 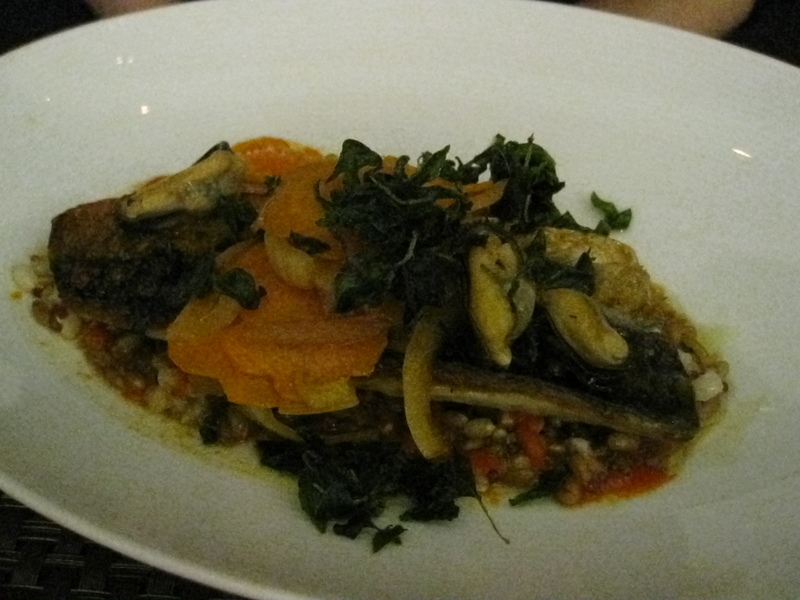 The grilled mackerel has wheat berries, smoked paprika and mussel escabeche. The mussel escabeche was quite tasty. My friend thought it was slightly salty albeit delicious. The roasted lamb shoulder also has pommes boulanger, heirloom carrot, and parsley root in natural jus. I found it abit too salty for my tastes. While it was quite tasty, I ate it with bread to help dilute the saltiness. 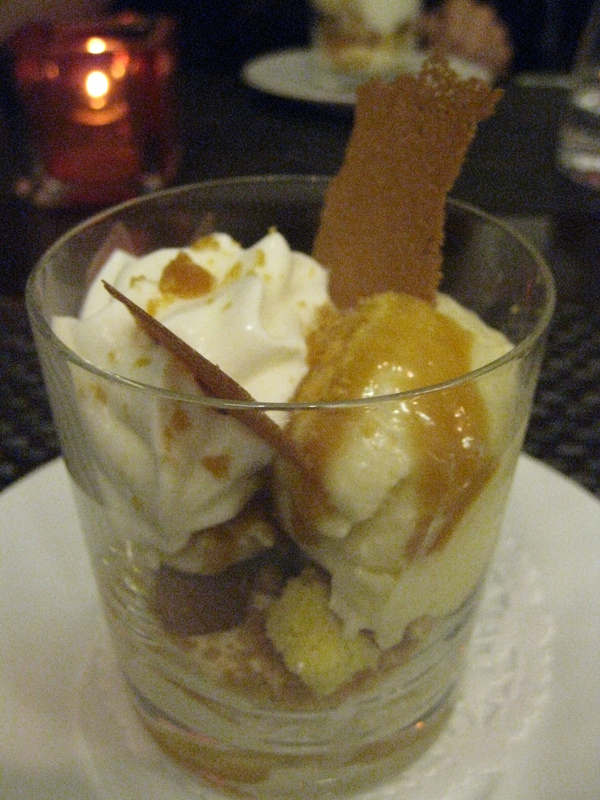 The caramelized pear sundae includes anise tuile, caramel sauce, whipped cream and calvados ice cream. Calvados is an apple brandy from Normandy. My friend was debating between the Chocolate Gateaux and the pear sundae while I was debating between the pear sundae and the Coffee & Cardamom Sundae. Our server said that we couldn’t go wrong with any of the desserts. My friend went with the pear sundae when the server said that the cake was rectangular and the portion was small. The people at the table next to us had the chocolate cake and coffee & cardamom sundae. The chocolate cake is a similar size to the single serving mini-cakes found at a grocery store’s bakery. The chocolate cake comes with a scoop of pecan bourbon ice cream. The coffee & cardamom sundae looked like a combination of chocolate and coffee. It made me wish that I could order two desserts rather than having to make a choice. Overall, while Cafe Boulud is pricy at $45 + tax and tip for a Winterlicious dinner; it’s worth it for the dessert and appetizer. Another university friend and I decided to have a late dinner at Banu this past Saturday. My friend wanted to try an exotic cuisine and I had suggested Iranian cuisine. I’ve been to Banu before and it was for Summerlicious. Winterlicious dinner is $25 + tax and tip. My friend and I both got the Kashk o Bademjan for the appetizer. 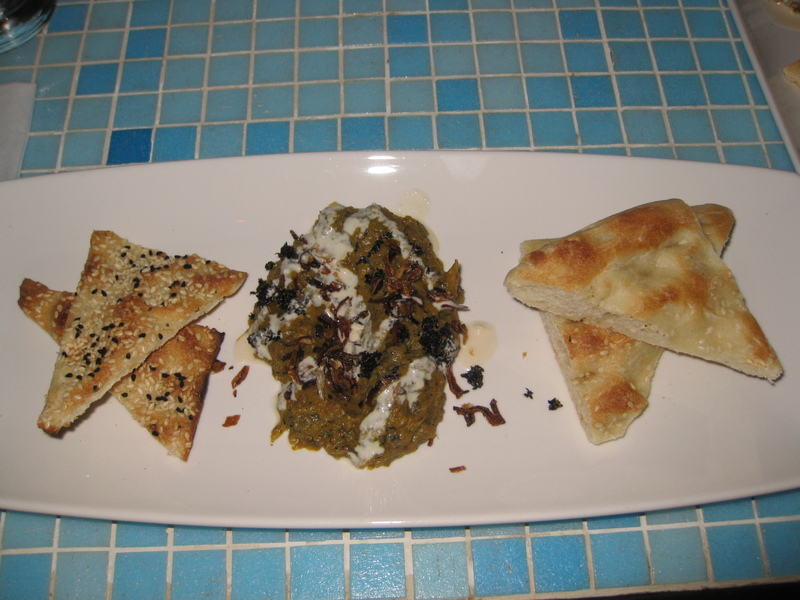 Kashk o Bademjan is roasted eggplant, turmeric, caramelized onion, fried mint, and whey paste that’s eaten with nigella seed barbari bread. It reminded me of the Mirza Ghasemi appetizer I had for Summerlicious. It was quite delicious. My friend had the Koobideh, on my recommendation through my Summerlicious experience. She loved it. 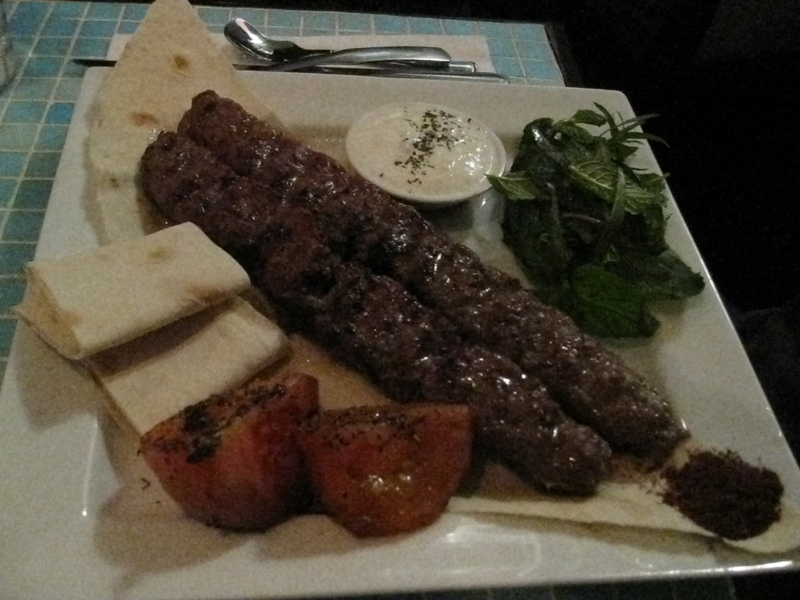 Koobideh is two skewers of ground angus sirloin with roasted tomato, fresh basil, yoghurt, mint and tarragon that is eaten with lawash bread. I wanted to try something different so I had the Morgh. The Morgh is chicken breast with a saffron citrus glaze, roasted tomatoes, fresh basil and yoghurt that is eaten with lawash bread. The Morgh and Koobideh are eaten in the same way, you rip a piece of lawash bread and put the meat, a piece of roasted tomatoes, some basil, spices and yoghurt in the bread and you wrap it up like a pita and you eat it. While the Morgh was good, I think I still prefer the Koobideh just because of how the beef tastes. My friend ordered the almond baklava cake on our server’s recommendation. At first I thought it would be like the Greek baklava desserts however it’s quite different. 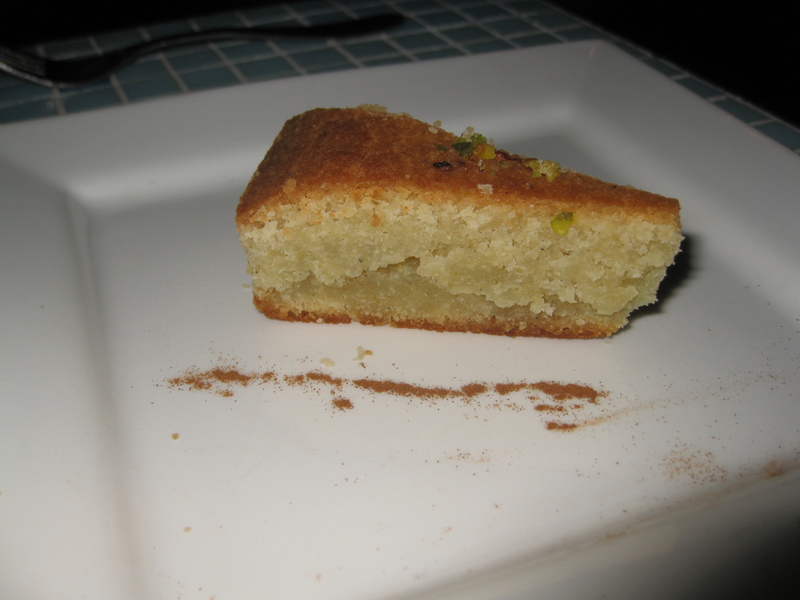 The almond baklava cake is a dense almond cake with rose water and pistachio flavours. It’s quite delicious. I had the Soma Chocolate plate. 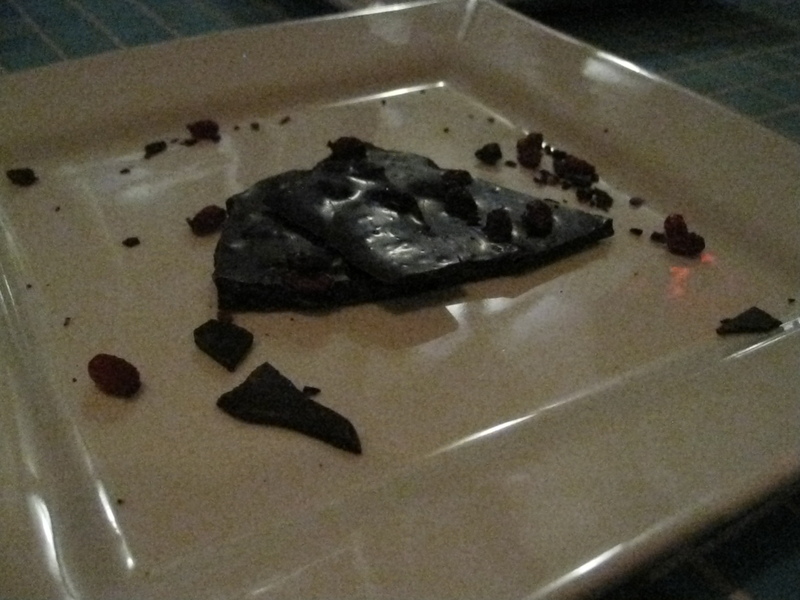 The Soma Chocolate is a piece of dark chocolate with nougat, sumach and barberry. It was good but I wasn’t completely impressed with the portion size. 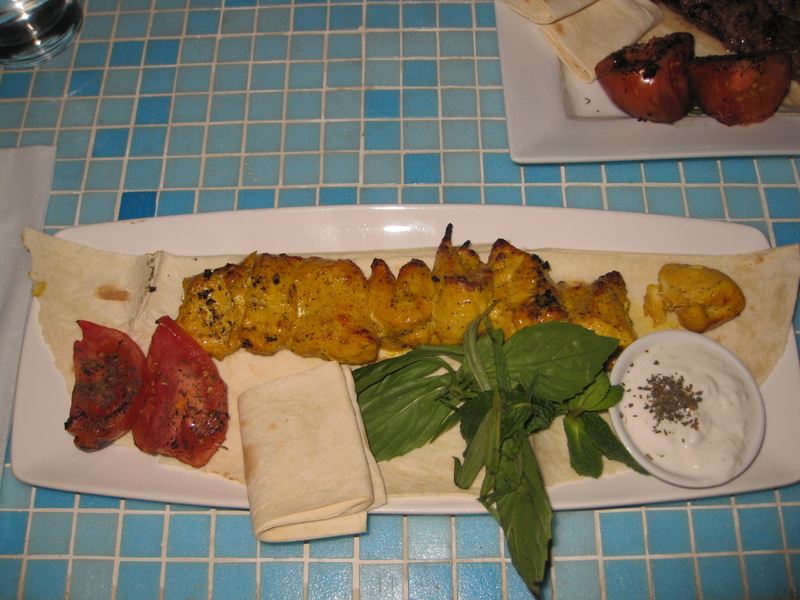 Overall, I recommend Banu if you want to try Iranian or Middle Eastern cuisine or just something exotic in general in Downtown Toronto. My university friend and I went to have dinner at bb33 bistro and brasserie. It’s located inside the Eaton Chelsea Hotel on 33 Gerrard St. W. It’s currently slightly hard to find just because of all the construction going on in the area. The decor was interesting while the service was very friendly. We sat near the bar so I noticed that they served Sleeman and Ephemere Apple Beer on tap. My friend likes how they have really gigantic bottles of wine in the niches of the wall by the bar. The Winterlicious dinner is $35 + tax and tip. My friend and I both got the duo of pork and duck rillettes for the appetizers. My friend had the spaghetti with shrimp, kale and roquette while I had the Riesling-braised osso buco. For dessert, my friend and I both got the Chelsea bread pudding. We both also had a glass of Ephemere beer ($7). When we first sat down we were given a glass of water and a plate of bread with choices of butter, balsamic vinegar/olive oil and this other dipping sauce. My friend first tried it and told me that it was slightly spicy. When I tried it, it had a spicy kick to it. We both agreed that it was some type of oil and somehow it was also spicy. I decided to ask our server about it and we were informed that it was chili oil. This is the first time I had bead with chili oil. It’s ingenious and it’s just as good as olive oil and balsamic vinegar with bread. It’s a very good combination if you can handle the heat. 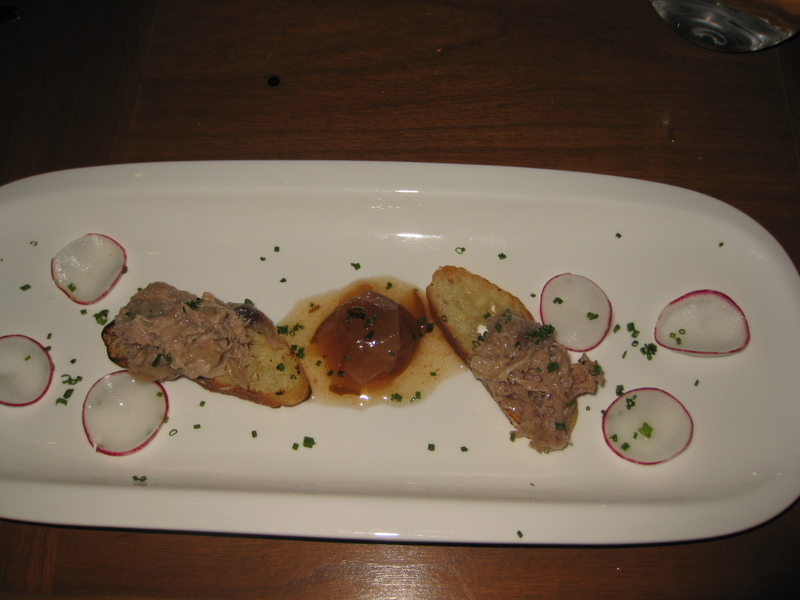 The Duo of Pork and Duck Rillettes is pork or duck on toast croûtes and it was garnished with Fleur de sel, pear and roasted garlic chutney, radish and roquette. It was very delicious for a bite sized appetizer. 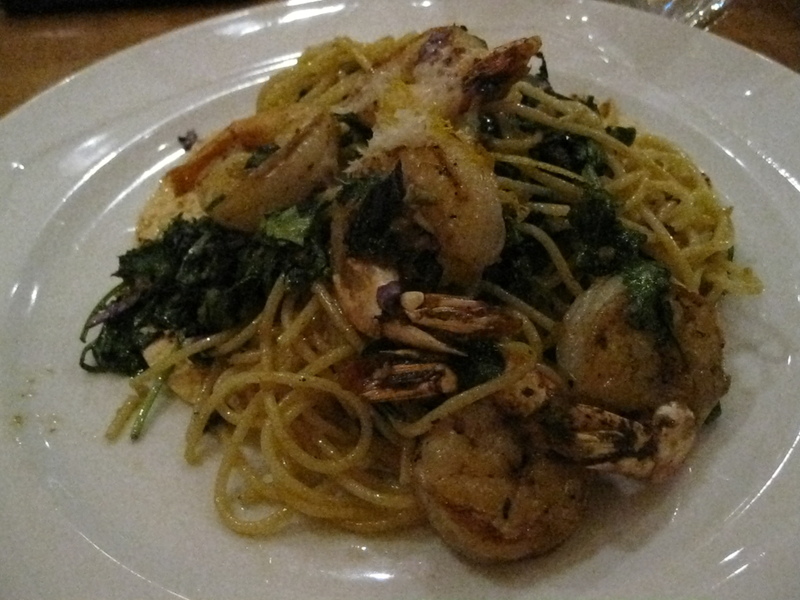 My friend enjoyed her spaghetti with shrimp, kale and roquette. The spaghetti with shrimp, kale and roquette is garnished with butter toasted panko, lemon zest and parmesan reggiano while it sits on top of a pappadum crisp. The papadum crisp has a spicy kick to it. I enjoyed the Riesling-Braised Osso Buco which was garnished with Kerr Farm tomatoes, mushrooms, onions and garlic while lying on top of the Israeli couscous risotto. 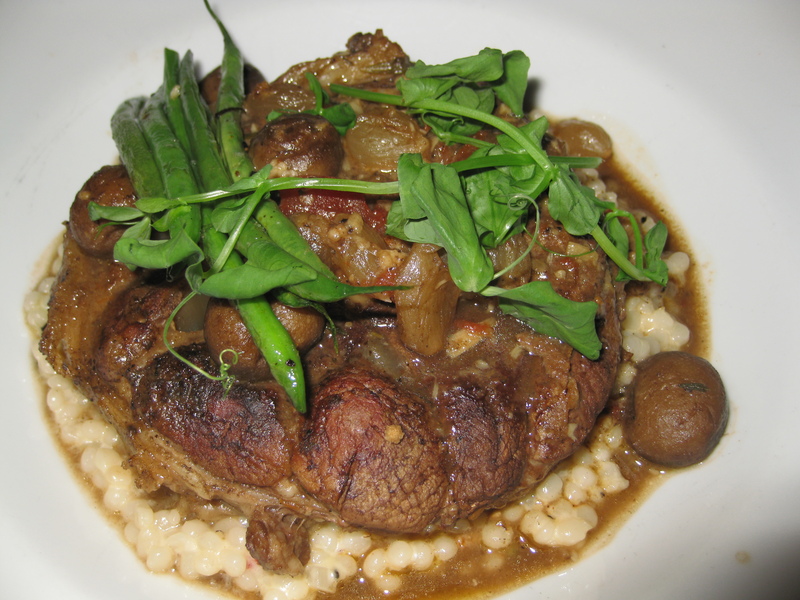 The osso buco is tender, juicy and abit fatty. At first I wanted to know what exactly was the Lemon Brûlée Tartlet however I was informed that it was sold out so I decided to go with the Classic Chelsea Bread Pudding. 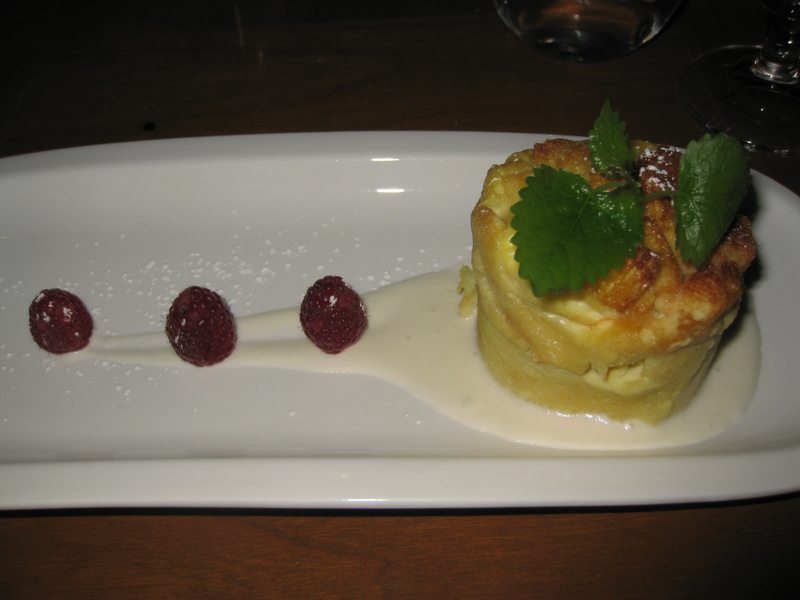 The classic Chelsea bread pudding comes with English custard sauce and 3 raspberries. My friend didn’t think it looked like bread pudding and thought it was quite fusion. Overall, I would recommend this place. The food quality is superb while service is very friendly. My childhood friend and I went to Tabule for lunch ($15 + tax) this past Sunday. It’s quite close to Five Doors North. The lighting was quite dim although my friend thought that the decor is quite nice. We split the combination plate and the kubbeh for the appetizers. My friend had the kefta kebab while I had the beef kebab. For dessert we both had the knaffa ashta. 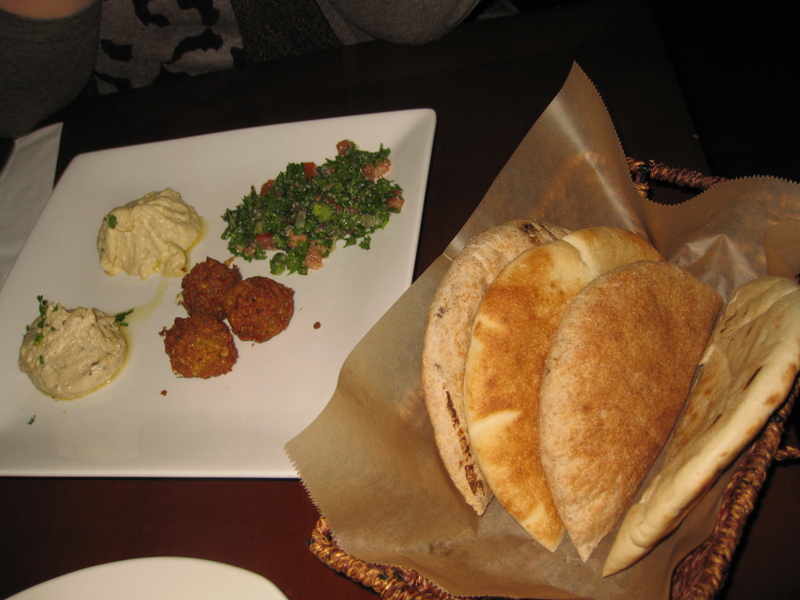 The combination plate composes of a basket of 4 pitas, hummus, tabule, babaganoush and falafel. I was slightly surprised at the portions although it may be because the plate was really large. 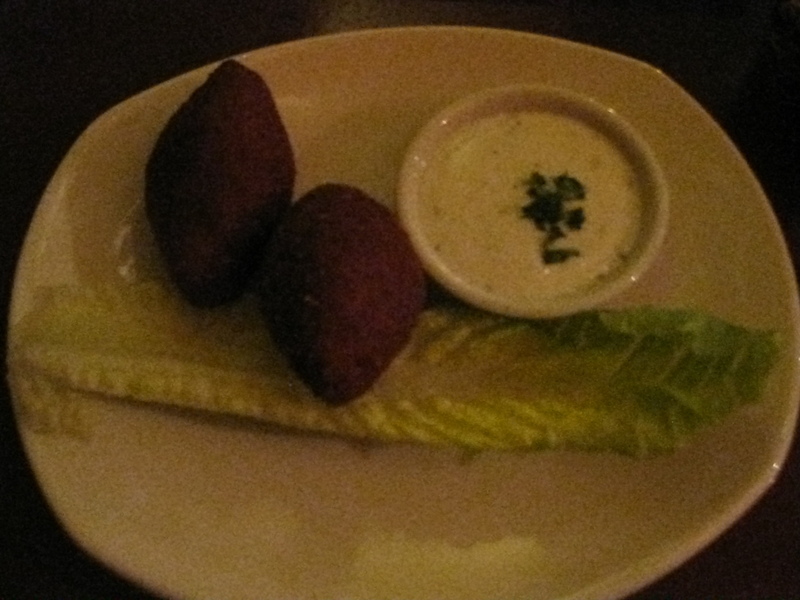 Kubbeh is a cracked wheat shell that’s stuffed with ground beef and lamb, pine nuts and onions with a yoghurt sauce and a leaf of lettuce on the side. It was quite tasty. 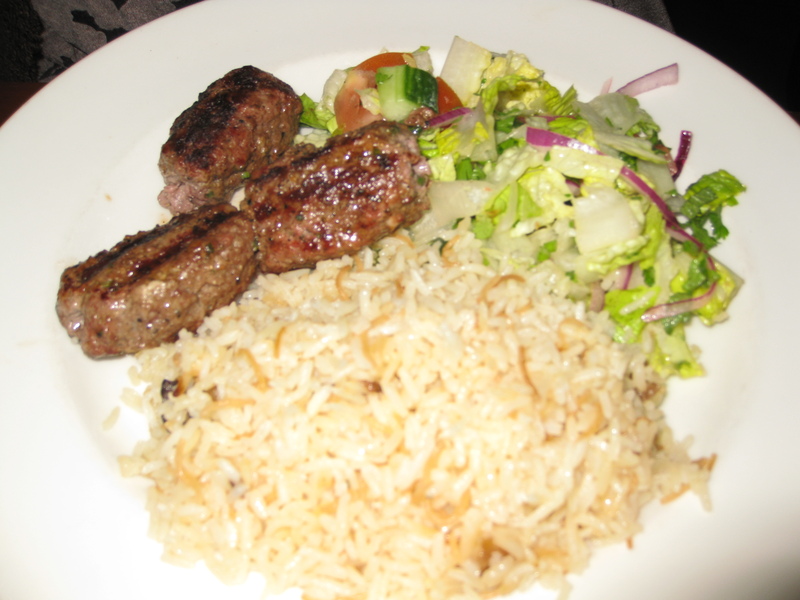 Kefta kebab is a kebab made from ground beef and ground lamb accompanied by salad and saffron rice. My friend asked for some yoghurt to dip the kebab with since the kefta kebab looked abit dry. My friend enjoyed the dish although she found the portions to be abit large. 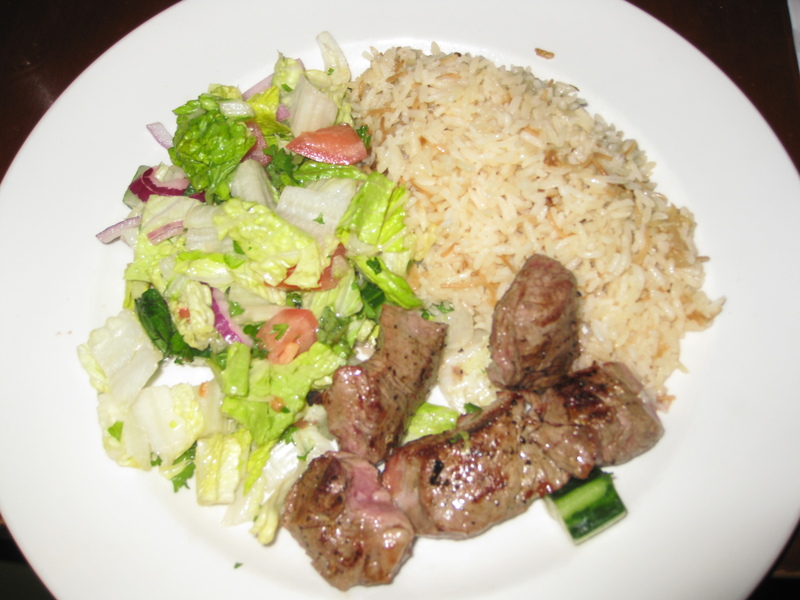 Beef kebab is veal filet which I had made medium rare that’s accompanied by salad and saffron rice. My friend ordered the knaffa ashta immediately while I noticed that Tabule’s online Winterlicious menu lists mango sorbet, blood orange sorbet or vanilla halva gelato as the choices for sorbet/gelato on the lunch menu. When I perused the Winterlicious menu at Tabule the dessert section made no mention of blood orange sorbet or vanilla halva gelato. There was only a choice of mango sorbet or pistachio gelato. At first I asked the server if I could have blood orange sorbet and he replied that they don’t have any left but they had pomegranate, lemon and pistachio. So I decided to try pomegranate. When we finished eating our appetizers and mains; the server informed me that they ran out of pomegranate so I could either choose lemon or pistachio or the baklava or the knaffa ashta. I decided on the knaffa ashta because I can easily get lemon sorbet and pistachio gelato at Food Basics or Metro. 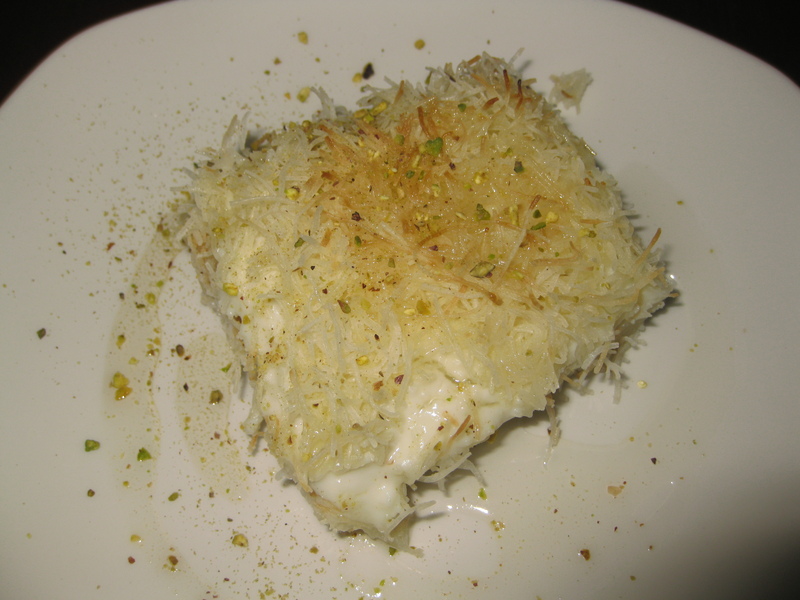 Knaffa ashta is angel hair filo on top of custard and drizzled with rose water syrup. The knaffa ashta was delicious. Overall, I don’t completely recommend Tabule. I wanted to go mainly due to the allure of blood orange sorbet and I was severely disappointed that they didn’t have any. I would have consoled myself with pomegranate but there was none left by 2:30pm on the third day of Winterlicious. The portions of the appetizers were smaller than I expected although the portions of the mains made up for it. While the quality of the food is good; I could get something similar at a nominal price at other Middle Eastern restaurants. My disclaimer is that I got myself too psyched up for the blood orange sorbet but to be unable to eat it when I was there leads me to not be able to completely recommend Tabule. My friends and I decided to eat dinner yesterday at Five Doors North. The Winterlicious menu is $25 + tax and tip. It’s a really quaint, decently sized restaurant. The decor was interesting in that the lighting was from hanging lampshades and mini chandeliers along with candles on the tables, although the lighting was abit dim. There’s music playing in the background and at times I couldn’t really hear my friends talk due to the background noise. 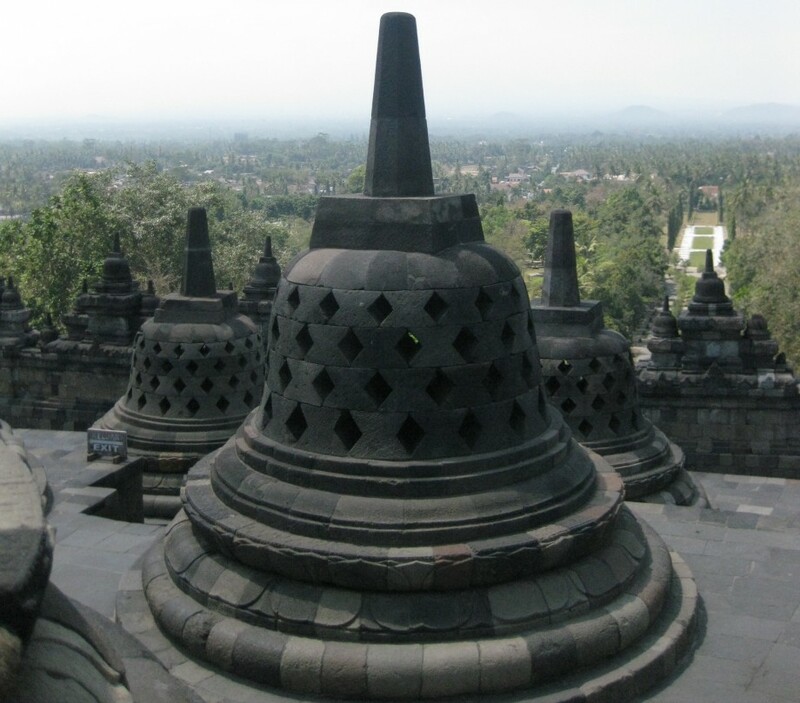 The service was fantastic and prompt. Due to the weather this past Saturday, my friends and I were slightly late for our reservations and we took a while to decide on what to order since there are 5 appetizers and 6 entrees to choose from. In the end, one friend had the Roasted Beet Salad with Scallion Dressing and Toasted Pumpkin Seeds for the appetizer, Pumpkin Seed Crusted Salmon with Mango and Smoked Red Pepper Salad for the entree and the Flourless Chocolate Cake for dessert. Another friend had the Crispy Pork Belly with Butternut Squash Mash, Caramelized Apples and Sweet Onion Reduction for the appetizer and Banana Chocolate Chip Bread Pudding for dessert. We split the Veal Striploin with Sweet Peas and Mushroom Cream Sauce and BBQ Baby Back Ribs with Smoky Baked Beans because we both wanted to try the two mains. I had the Baked Goat Cheese with Polenta, Sundried Tomato Paste and Pesto for the appetizer and Crème Brulee for dessert. When we sat down, we were provided with water and slices of bread. There’s a bottle of olive oil, balsamic vinegar and ground black pepper on the table. 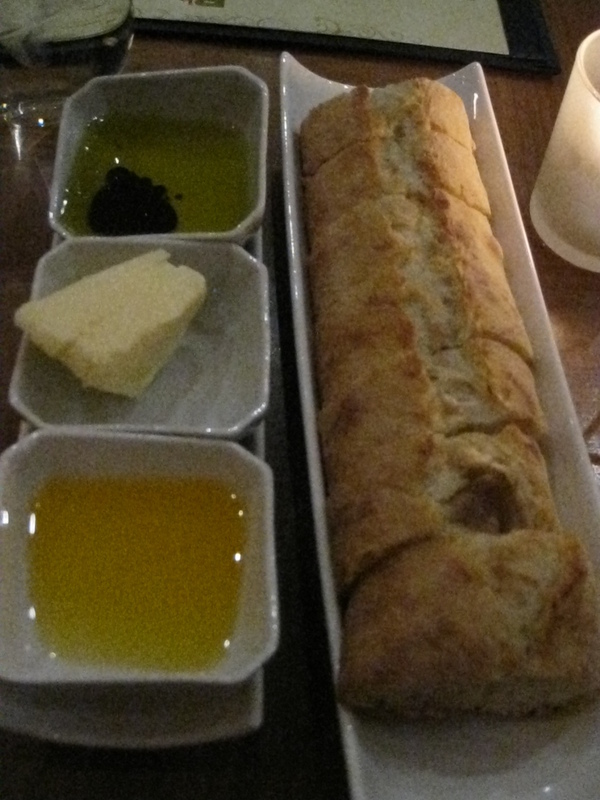 The bread was alright, it wasn’t as good as the bread I had at Au Pied du Cochon in Montreal. Our table was close to the bar and kitchen so I noticed that their alcohol selection is fairly extensive. My friend really enjoyed the beet salad. 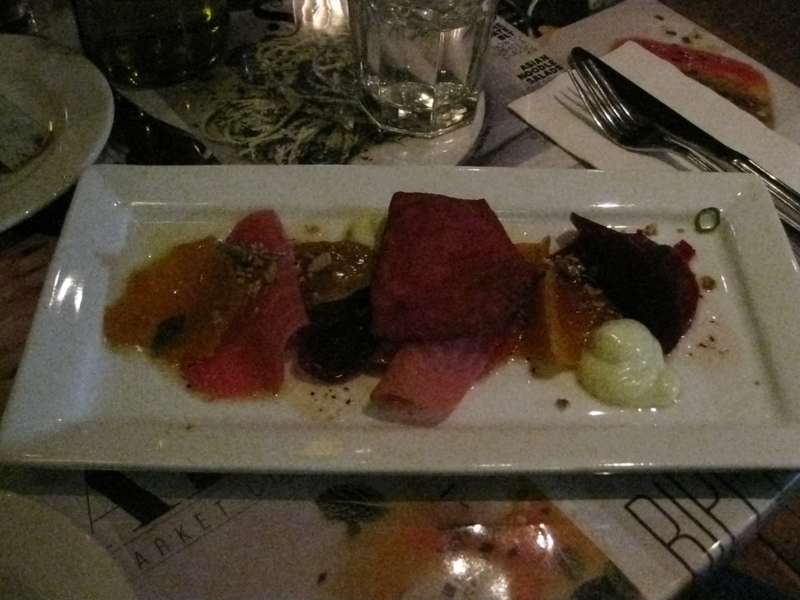 The beet was nice and sweet while the cream was a nice touch to the dish. My other friend loved the pork belly with butternut squash and sweet onion reduction. 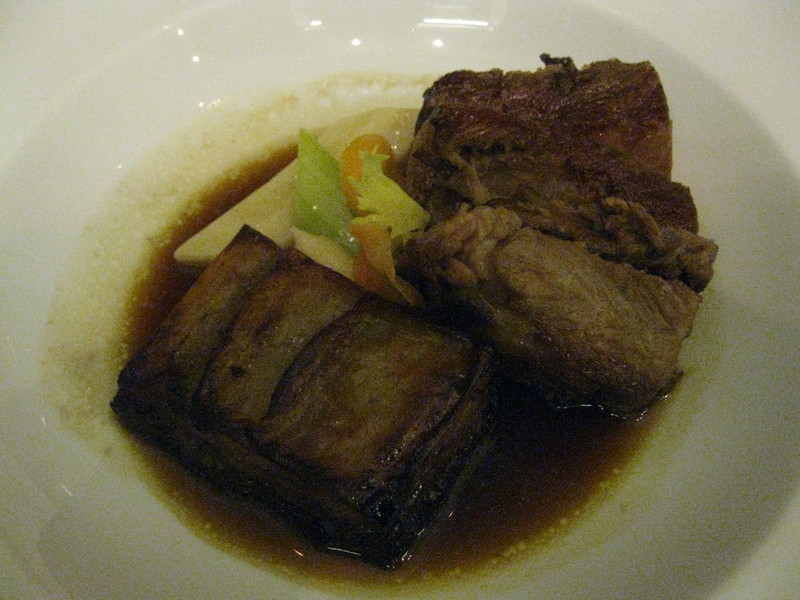 It had a crispy, crunch skin while the meat was really tender and quite juicy. 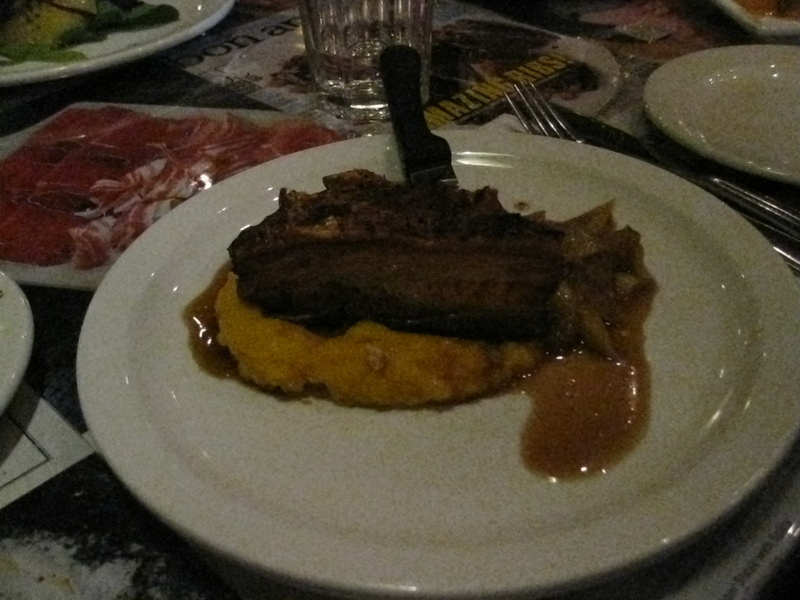 The butternut squash mash with caramelized apples and sweet onion reduction was a nice touch to the pork belly. 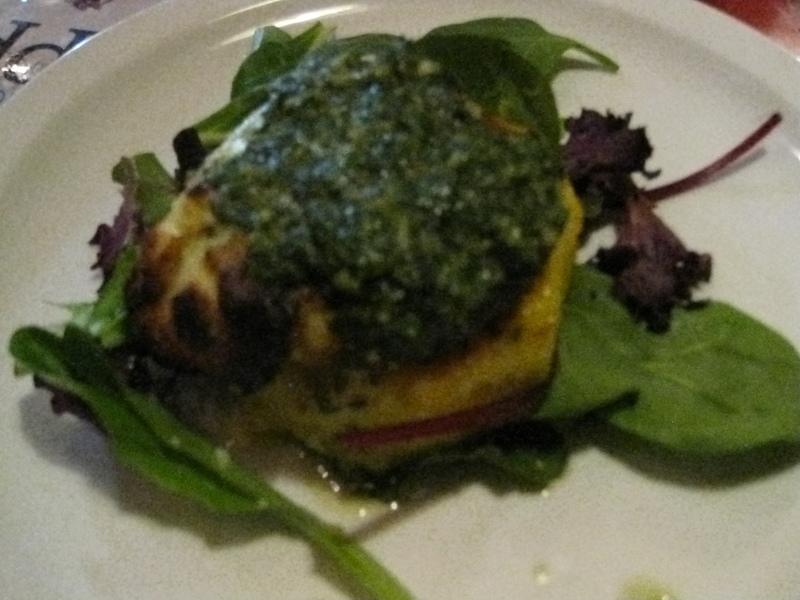 I loved the goat cheese polenta with sundried tomato and pesto on a bed of leafy greens. I feel that you can never go wrong with the goat cheese, sundried tomato and pesto combination. Although I didn’t really see or taste the sundried tomato in the polenta. 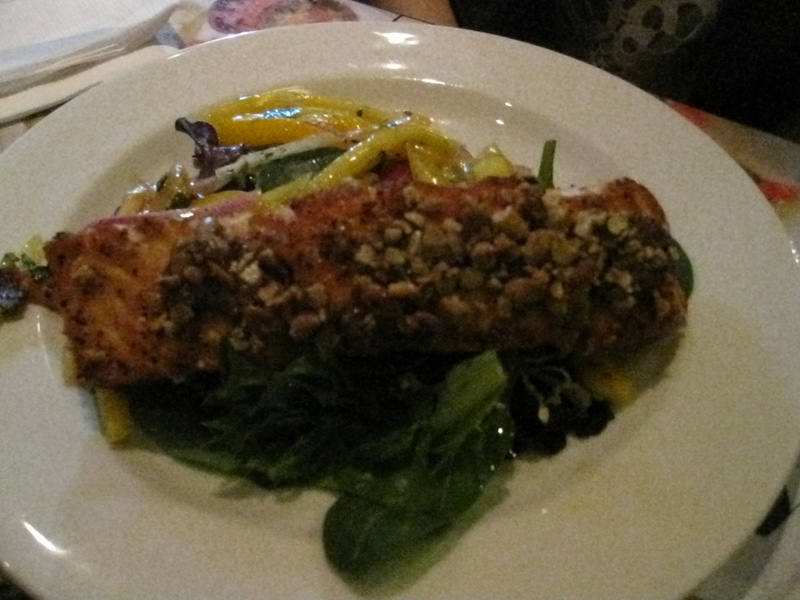 The pumpkin seed crusted salmon with mango and red pepper salad was really good, my friend loved the dish. The mango and salmon combination is superb. When my friends asked whether I prefer the pork belly or the goat cheese polenta I told them I couldn’t really choose between the two cause it’s almost like comparing apples and oranges, I loved different aspects of each. When my friend and I split the BBQ baby back ribs and the veal striploin, I had a preference. I absolutely loved the BBQ baby back ribs. 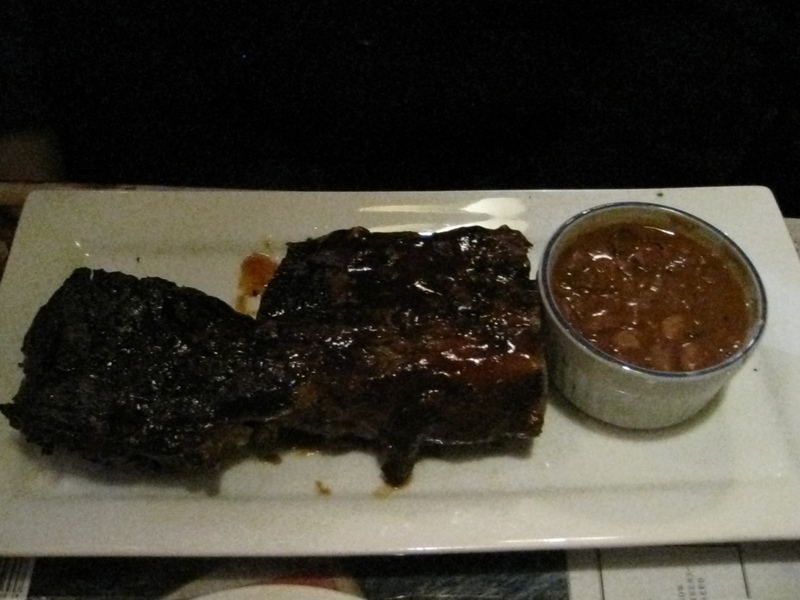 The baby back ribs were fall off the bone or nearly fall off the bone tender and juicy and the baked beans sauce just added another dimension to it. I had the veal striploin cooked medium rare and it was cooked perfectly. 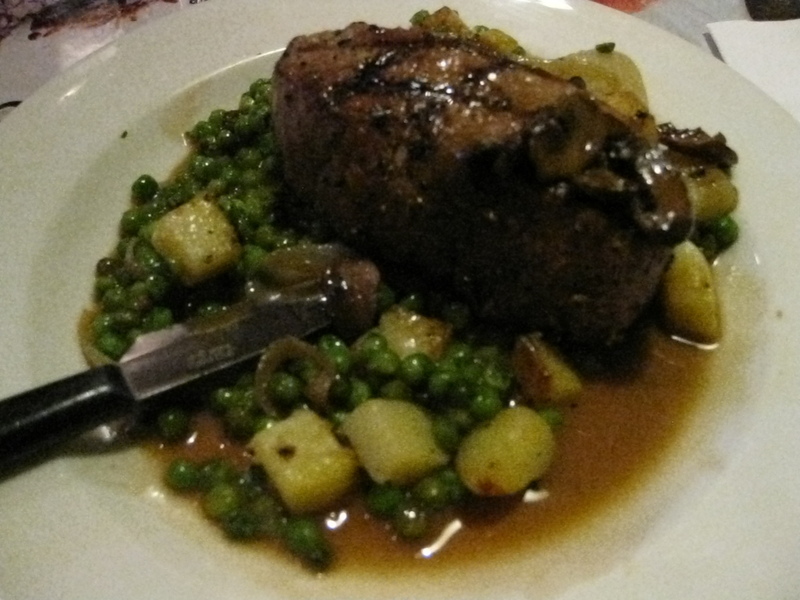 The green peas, mushroom, potatoes with gravy complimented the veal striploin but my friend and I couldn’t really figure out what was missing from the dish in order to make it on par with the ribs. 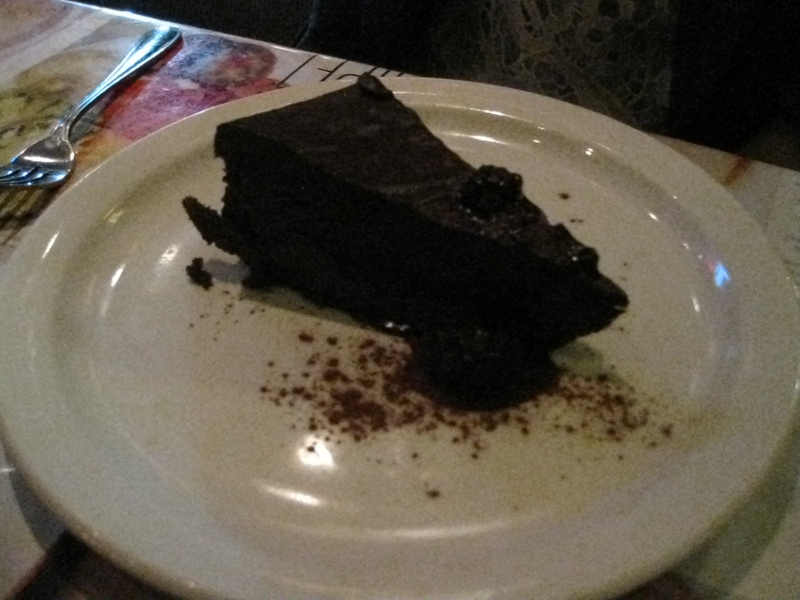 My friend also enjoyed the flourless chocolate cake. It has a very chocolatey taste to it, I think they used dark chocolate rather than milk chocolate to make it. My other friend loved the bread pudding. 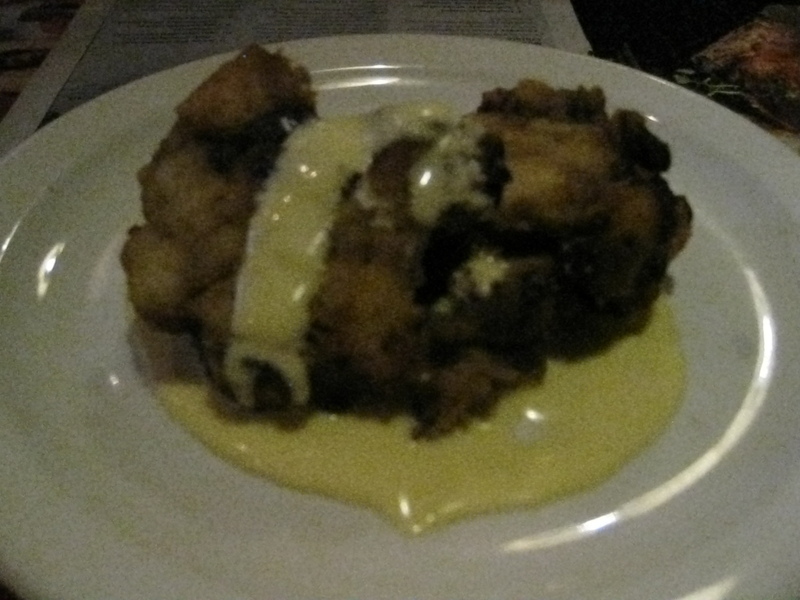 Bread pudding is baked french toast as my friend aptly describes it. 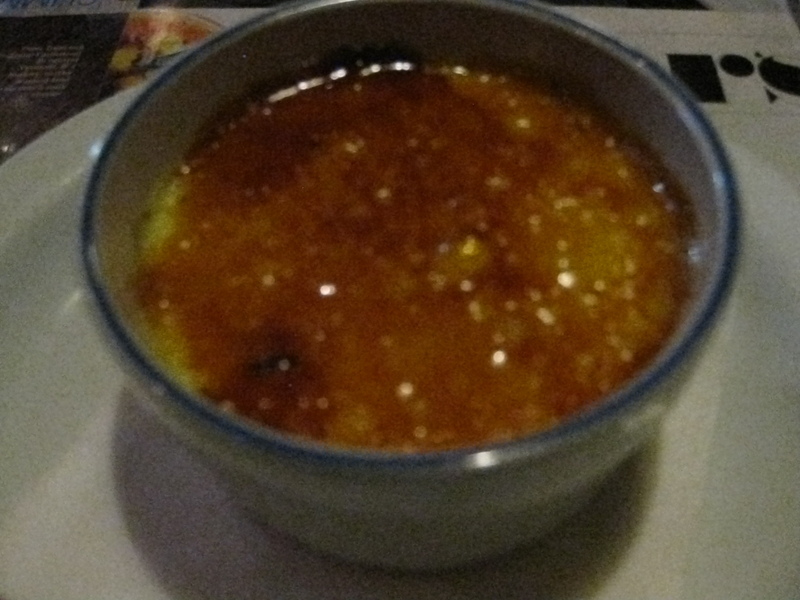 I enjoyed the creme brulee. The caramel was a thin layer that wasn’t too hard to break. The custard was smooth and creamy. Overall, I recommend this restaurant for their service and food quality. If you have time in the next week and a half, take advantage of their Winterlicious menu and make your reservations.